Let your spirits soar! 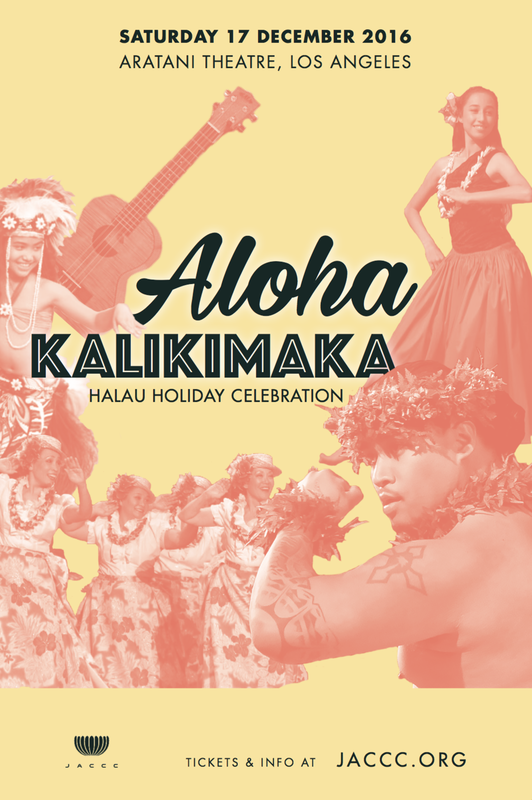 Join four beloved Southern California Kumu Hula and their award-winning halau as they come together to share this aloha and holiday-infused dance and music performance. Little Tokyo residents also join in the celebration with a special performance by Ukuleles for Little Tokyo. Discover and experience the unique spiritual connections of Hawai'i. In the spring of 1991, Kumu Hula Keali'i Ceballos founded Hālau Hula Keali'i o Nālani. Kumu Kealiʿi’s love of music and hula started with his parents, Al and Cissylani Ceballos, when Aunty Cissylani introduced hula to her son at an early age. Although Kumu Kealiʿi has studied under several renowned kumu hula and has been teaching for 25 years, he will always consider himself a journeyman who continues to expand his knowledge of Nā Mea Hawaiʿi (things Hawaiian) and strives to perpetuate the Hawaiian culture through hula. Since its inception, the hālau has grown and includes nā keiki (children), nā ʿōpio (youth), kāne (men), wāhine (women), mākua (parents) and kūpuna (grandparents or elders). While the haumāna (students) represent a diverse group ranging from beginners through highly trained and experienced dancers and competitors, they share one thing in common --- the love of hula and the Hawaiian culture. Throughout its 25-year history, Hālau Hula Keali’i o Nālani has shared its aloha for hula and the Hawaiian culture with performances at numerous hula competitions, festivals and community events in California, Florida, Hawai'i, Nevada, Washington, Japan, Mexico and Taiwan. In 2011, Kealiʿi received the Los Angeles County Board of Supervisors Proclamation for 20 years of cultural service to the Los Angeles community. Halau Kaulana Ka Hale Kula O’ Na Pua O’ Ka ‘Aina was created by Kumu Hula Randy Kaulana Chang in 1999. The halau was created to perpetuate Native Hawaiian culture through crafts, dance, music, and history on the continent as well as other Polynesian history and music. Haumana (students) are taught to make many of their own implements as well as their own leis and attire. The halau has had the opportunity of sharing our knowledge of dance and Hawai’i with other halau through workshops and competitions. The halau has competed in Merrie Monarch on the Big Island of Hawai’i and E Hula Mau, Southern California’s largest hula competition. The halau also performed with some of Hawai’i’s most well known musicians, including the Makaha Sons and Kanilau. History is perpetuated through formal lectures on different aspects of Hawaiian culture as well as being incorporated into everyday life in the halau. Kaulana Ka Hale Kula O’ Na Pua O’ Ka ‘Aina is a proud member of the Kumu Hula Association of Southern California. We are a professional, authentic Polynesian dance troupe that performs songs and dances from Hawaii, Tahiti, Samoa, New Zealand, Tonga. Our troupe has dazzled audiences for more than 15 yrs. The live music of "Kalika" and the dances of Halau Hula a Kawika laua 'O Leinani have captivated such audiences as the Hawaiian Hilton Village in Oahu, the Donny and Marie Show, the Disney Company, Jet Propulsion Labs, Hughes Aircraft, the House of Blues, Keali'I Reichel at the Hollywood Bowl, the Las Vegas Fremont Experience, and the Aloha Concert Jam to name a few. Recently the troupe completed a marketing tour with the Hawaii Visitors and Convention Bureau throughout Southern California and Europe. Ukuleles for Little Tokyo (U4LT) is a new 20-week program sponsored by The Annenberg Foundation, JACCC, LTSC, Ukulele Creations, and U-Space serving up to 140 Little Tokyo residents by providing free instructional classes, Little Tokyo-wide Kanikapila jam sessions, and the opportunity to keep an ukulele (upon completing the 20-week program). The program is geared towards engaging with low income Little Tokyo residents of all ages while providing instruction in Japanese, Korean, Spanish, and English. By providing in-language services, we are also helping to breakdown the cultural barriers and provide spaces where participants can feel welcome and at home at JACCC. Fall 2016 classes were held at JACCC, Casa Heiwa, and Miyako Gardens to residents who registered in September 2016. Spring 2017 classes will start in February with applications being accepted in January. Aloha Hula is under the direction of Lyn-Del Laua'e Pedersen. She started teaching out of her home in 2006. In 2007, she opened her studio where she along with her sons, Taimane and Kaikea, teach Hula and Tahitian dance. Lyn-del has been dancing off and on since she was 5 years old and has been a professional dancer for over 30 years. As a child her basics were taught to her by Napua Wood and Telu Mansfield. She was also greatly influenced by her parents, aunties and uncles as they were all professional Polynesian Dancers back in the 60’s. She continues to perpetuate the culture within her own family. Her husband and all 5 of her children either dance or play music. At Aloha Hula they strive to provide their students (haumana) with an understanding of the origins of traditions, while also encouraging new expressions of Polynesian arts, music, and dance.